The Saint Nicholas Society of the City of New York was founded by Washington Irving and others, as an organization to commemorate the history and heritage of New York, and to promote good fellowship among the members. The first meeting was a dinner held on February 14, 1835 at Washington Hall, a popular dining and meeting locale in the 1830s, at the southeast corner of the intersection of Broadway and Reade Street. At that meeting 31 gentlemen signed the constitution of the Society. On February 28, the first members were elected, a total of 275. At that time there were (as there still are) several societies named after national patron saints, such as Saint Andrew (Scottish), Saint David (Welsh), Saint George (English), and Saint Patrick (Irish). Irving, the great humorist and chronicler of the Hudson Valley, and author of such immortal tales as Rip Van Winkle and The Legend of Sleepy Hollow (as well as of many other works), conceived The Saint Nicholas Society as a somewhat humorous counterpart to the celebration of national origins by such organizations. Also, the New England Society in the City of New York had been recently established in 1805 to promote awareness of New England history and traditions, and many New Yorkers felt that they should, in friendly rivalry, assert their own cultural claims. A spirit of fun, suggested by the jolly character of Saint Nick himself, remains characteristic of the Society. Nevertheless, there was a serious component in the founders’ organized attempt to recognize the distinctive history and character of New York, especially at a time when the city was becoming a major national and international center of commerce, of finance, and of arts and letters. The original members of the Society were drawn from the same kinds of people as comprise the membership today: writers, lawyers, merchants, bankers, and other professionals, active in the public life of the city. Membership was by invitation to persons whose family had lived in New York prior to 1785, which was about when Irving’s family had arrived in New York. 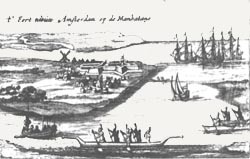 From the beginning, members of the Society have come from many nationalities and ethnic groups, reflecting a diversity appropriate to the cosmopolitan city that New Amsterdam had been and that New York was and still is. The common denominators of membership have always been enjoyment of cheerful social events, and interest in the interchange of ideas and points of view, in an entirely non-political, non-controversial context. Active members may range in age from eighteen to one hundred plus, all meeting together as equals. The principal activities of the Saint Nicholas Society have from the beginning consisted of several dinner meetings each year, between the months of October and May. The current schedule is for three “stated meetings” in the fall, winter and spring, as well as a dinner on or near the Feast of Saint Nicholas (December 6th), and an annual ball at Eastertime called the Paas Festival (from Paas, the Dutch word for Easter). At the ball, members’ relatives or friends may make their debut. These events are typically held at a club, hotel, or similar gathering place. Other activities consist of outings to sites of historic interest, such as Washington Irving’s “Sunnyside” in Westchester County. The Society has also, over the years, issued a number of publications that include biographical sketches of early New Yorkers, and historical discussions of aspects of the Dutch colonial and British colonial period. In 1993 the Society published The Saint Nicholas Society: A 150 Year Record, containing essays about the Society, and a list of members from 1835 to date of publication. From the early days of the Society through the 1950s, Society events were all-male occasions. But in recent decades, guests at most meetings have included women as well as men. Often there is an address by a speaker on a topic of current or historical interest. Certain meetings are centered upon the award of the Society’s medal of merit, or the award of the Society’s Washington Irving medal for literary achievement. The Society’s Paas Festival for the year 2005 was a benefit dinner dance that raised money for the preservation of the historic building of St. Mark’s Church-in-the-Bowery. Such events help the Society to fulfill its mission to preserve the historical heritage of New York.